For ten years now, Space Angels has been at the forefront of early-stage space investing, amassing the most comprehensive database of public and private space investments. It is this knowledge that provides our investor members with the insights they need to make informed investment decisions in this dynamic industry. With ever increasing interest in space investing, multiple reports and websites have been publishing data that directly influences the narrative across the industry. We carefully monitor each one of these reports for completeness, accuracy, and insight. After observing a wide and inconsistent range of data across these sources, we saw the need to set the record straight. 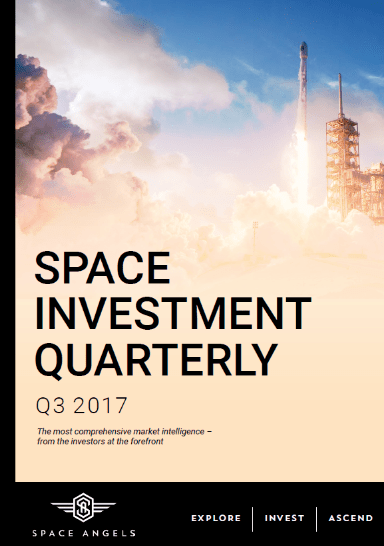 The Space Angels’ team is pleased to share our maiden quarterly space investment report. This is the first time we are releasing our proprietary information in its entirety. The team has gone to great lengths to not only build this data, but also present it in a way that will help you understand the key relationships between investments and market drivers that shape the frontier of this dynamic industry. ARE YOU LOOKING FOR MORE SPACE? There is serious financial upside to space investing, and commercial space is inspiring a new generation of scientists, engineers and entrepreneurs. Your investment will be instrumental in making this happen. The fact is that space angels are investing in innovative ventures that will help launch humanity’s storyline off-planet. © 2019 Space Angels Holdings Inc. All Rights Reserved.